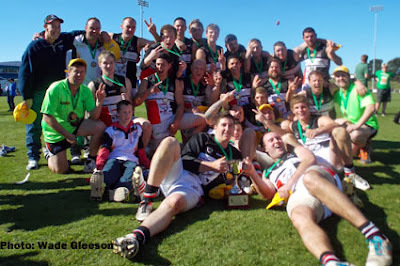 SFL grand final day yet again proved to be a great day for the New Norfolk District Football Club. 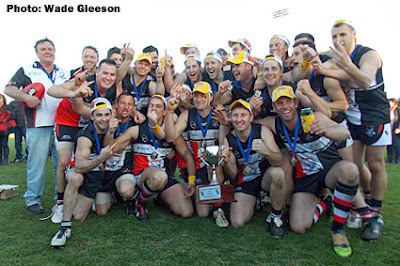 Back-to-back premierships for both the seniors and reserves was just what every Eagles supporter ordered. With the sky blue and the sun shining, the reserves made it a great start to the day, overcoming Kingborough by 18 points. The Tigers led at quarter time by just two points and at the main break stretched their lead out to 14 points. But from here on the Eagles kicked six goals to one in the second half, outrunning and out-classing the Tigers outfit. Kris Cashion kicked two goals for the day, taking his tally to 67 for the season while Aaron Papera was awarded the Johnstone Medal for an excellent best on ground performance. 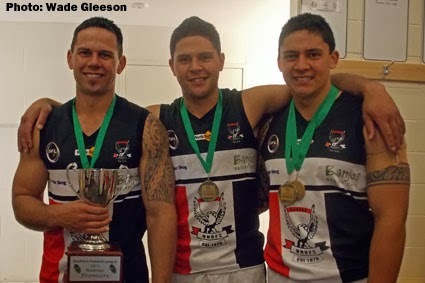 Aaron along with his brothers Joshua and Joseph all played in the premiership win and to cap it off the three were all named in the best players. I'd say having three brothers in the one premiership team would be a first for the Eagles, well done fellas! Well done also to Mark Cashion on winning the premiership in your first year as coach, he must have been thrilled. 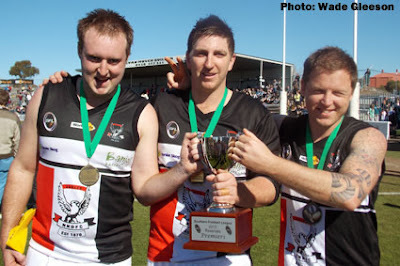 The reserves have now played Kingborough in the big one for the last three years, winning the last two. They have now won 11 premierships! The senior side also continued on its winning way, accounting for Claremont by 43 points. The game was much closer than this for most of the four quarters. The Eagles led by 11 points at quarter time and 25 at half time. The Magpies got to within 10 points just before three-quarter time, but two late goals by the Eagles stretched their lead to 23 points at the last change. In the final quarter, Claremont kicked the first goal and reduced the deficit to 17 points, but from here the all-conquering Eagles kicked four unanswered goals making it back-to-back premierships and securing their fourth premiership in five years and 25th over all. 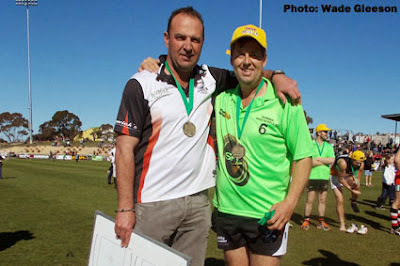 Onballer Nathan "Weapon" Ross played another magical game, being awarded the Gorringe-Martyn medal for best on ground. After winning the William Leitch Medal and Huon Valley News best player on the Monday and a premiership on the Saturday, Ross should consider insuring his hands as every thing he seems to touch turns to gold or silver! New find Zeke Gardam led the way up forward, kicking three majors as did Ross while the high-flying Michael Thompson kicked two. Coach Jon Murray must be pinching himself - last season he coached the reserves to the premiership and now he is a senior premiership coach. Excellent work Muzza, you have certainly molded the team very well. 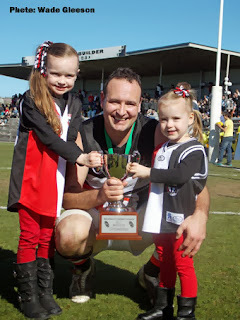 Leigh Post returned to the Eagles for his last season of footy and won't forget his final game, going out with a premiership. The script could not have been written any better. Well done Postie and well played, you have been a great servant to the NNDFC and it's been a pleasure to watch you play. Simon Crane on played his 100th club game in the senior grand final. He won't forget that in a hurry and he as amongst the best players. Well done. The attendance for the day was said to be more than 5500, bettering last year's crowd of 4956. It was great to see many Eagles fans make their way to KGV, decked out in the red, white and black. 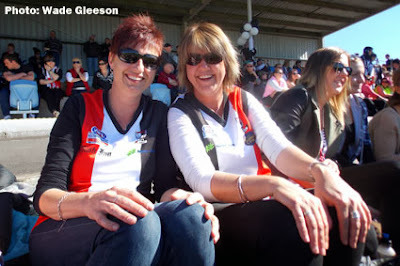 The party back at the clubrooms was just terrific with many family and friends coming along to help celebrate what was a great day for the club. Well done to all involved, the future looks very promising with the Under 18s finishing third with many fine players that will soon step up to senior level. Well done to coach Nick Clayton, top job mate. Goals - New Norfolk: Z. Gardam 3, N. Ross 3, M. Thompson 2, B. Wardlaw, K. Styles, J. McCulloch, J. Clifford, B. Chaplin, R. Belcher, B. Booth; Claremont: N. Brown 3, J. Wood, S. Jones, D. Kamaric, S. Webster, A. Arnold, B. Barwick. Best - New Norfolk: R. Belcher, R. Heron, N. Ross, Z. Gardam, M. Horne, S. Crane; B. Barwick, D. Fox, P. Bedford, A. Bennett, N. Brown, J. Price. Goals - New Norfolk: K. Cashion 2, M. Cashion, A. Papera, N. Eiszele, T. Triffett, A. Minchin, D. Wall; Kingborough: B. Livingston 3, A. Crane , O. Burke. Best - New Norfolk: Joshua Papera, Joseph Papera, A. Minchin, M. Cashion, T. Triffett, A. Papera; Kingborough: S. Sartori, D. Townsend, B. Livingston, B. Foster, D. Glover, R. Bevan.